Tera Highbarger Hogan, BHP 2004, is the incoming chair of the BHP Advisory Board. Tera is currently a Staffing/Recruiting Manager for Google, based out of their Austin office. 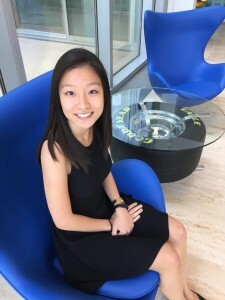 Before joining Google, Tera was a management consultant at Accenture for many years and worked for Novotus, both in the area of program management. Why did you decide to get involved through serving on the BHP Advisory Board and do you have any goals for your time as chair of the advisory board? I really enjoyed my time in BHP and valued the programs that BHP offered. As an alum I want to be a part of making sure our great base of alumni is doing what it can to support the program. During my term, I will look for ways that alumni can provide more support and help to the program and how we can raise the profile of the program nationally. I would love to see more out-of-state applicants and more diversity of in-state applicants. You had many roles at Accenture and stayed there for eight years. What did you most enjoy about working for Accenture and how did you develop professionally during that time? What I enjoyed most about my time at Accenture was getting to see a variety of types of work and clients. I was exposed to a breadth and depth of businesses early on in my career. I was also fortunate to have a lot of client relationships at senior levels, especially considering how early I was in my career. Each project was different than the one before. I had to come in and learn a new area, identify what the clients’ needs were and be able to deliver on those. Throughout my experience at Accenture, I built my client relationship and program management skills and ensured that the clients’ needs were met. You spent the majority of your career in program management and then switched to recruiting. What prompted that change? I loved my time at Accenture and wouldn’t change that for anything. It was a great place to start my career. I had been doing the same thing for a while though, and I was interested in other types of work and in being in a business, instead of just being a consultant for one. I was also looking to get off the road and spend more time in Austin. I decided to take a job with Novotus, a recruiting firm where I was still leveraging the program management and client relationship management skills I had built. I have always been most interested in the people side of business. When I was working for Accenture, I enjoyed career development with my staff and recruiting activities, so I was drawn in by these parallels and the opportunity to spend more focus on people. 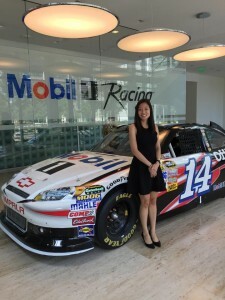 What are the challenges of recruiting and staffing for a company the size of Google? The volume, scale and complexity of Google is a challenge in everything we do. Google is looking to hire the best of the best for each and every role. There is such a variety of things at which people excel and for which they could be a good fit. Matching people with their perfect dream job, not just the next job, is our goal. My teams are focused on passive candidates – people who haven’t applied, but that we have gone out and found because they are the best in their field. We get in touch with them and get to know them, to find out what they are interested in pursuing. We find out what they are passionate about and what their goals are to see if we can make that happen for them at Google. Google has long been considered one of the best and most fun places to work. How do you sell your recruits on working there and what do you enjoy about working there? We sell our recruits more on the work they will be doing. The fun is certainly a piece of it, but what they are most interested in is working on cool, challenging projects and how they can really change the world by what they will be working on. It is a fun, laid back environment to work in with free meals on campus, scooters – all those fun things. We work hard, but we also have fun. As a recruiter, what advice do you have for students interviewing for jobs and internships? Do your homework on the company and be yourself during the interview. They are assessing if you are a good fit for the job as much as you are assessing if it is a job you would want. You will be doing this job 40 hours a week, at least, so you want something that is a good fit and that you will enjoy. Also, don’t stress so much, it will all work out!! It’s easy to get wrapped up in thinking this is what you will be doing forever, but that isn’t the case, and really you’re looking for the best starting point for you (which won’t be the same as everyone else). How did BHP prepare you for the work you have been doing? The small classes and project focus of BHP prepare you for the real world because that’s how the real world is structured. You have to work with others to solve problems. There are also many times when you will have to work with people you don’t have authority over and in school you practice that when working with peers on group projects. 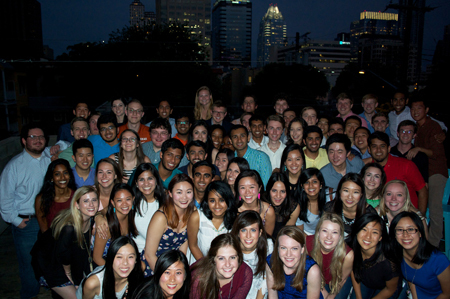 What are some of your best memories from your time at UT? Making new and lifelong friends, and spending time with those friends. Also having a flexible daily schedule, which you don’t get when you start working. I have been in a book club with some of my BHP friends who live in different cities, and even different continents, for over 10 years now. The BHP friends you make are always going to be people who understand things you are facing in your career and will be there to provide great advice and guidance, because they are probably walking down a similar career path to you, even if it is in a different industry. BHP Class of 2015 at the Make-a-Mark finale event. Every year, the BHP senior class coordinates and contributes to the Make-a-Mark scholarship campaign. The campaign plays a crucial role in the growth of the BHP by contributing needed funding for merit-based recruiting scholarships. This year’s campaign, which culminated this past Thursday with a finale event, was the most successful campaign to date! The BHP Class of 2015 exceeded their $20,000 goal, raising $27,488 with 100 percent participation from their class. The campaign also received $63,036 in contributions from faculty and friends of the program. Long-time BHP supporters Will and Beverly O’Hara generously contributed $60,000 of those funds. The total raised from this year’s campaign was a whopping $90,524. These funds will go into the Make-a-Mark endowment, which spins off funding each year for merit-based scholarships. Will and Beverly were present at the finale event and shocked everyone when Beverly announced that they were going to double the $30,000 they had initially agreed to contribute to the campaign to $60,000 to honor the class for such a successful campaign. They had initially pledged to match the $20,000 student goal dollar-for-dollar, with an additional $5,000 if the class reached $20,000, and another additional $5,000 if they had 100 percent participation. Will O’Hara was an accounting lecturer for 10 years and taught the BHP Managerial Accounting (312H) class for two years before stepping away from the role in 2013. This year’s senior class was the last class he taught and Beverly wanted to honor Will and this class and celebrate their graduation in a special way. The BHP’s dream is to offer fifty percent of students some kind of financial aid. The success of this year’s campaign has certainly contributed to that goal. A big thank you to the O’Haras, the BHP senior class, and the faculty who were so supportive of the campaign. Also a huge thank you to the 2015 Make-a-Mark committee and co-chairs, whose names are below, for leading such a successful campaign. 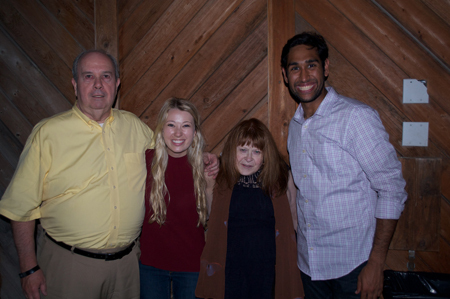 Will and Beverly O’Hara with co-chairs Morgan Lundy and Neal Makkar. 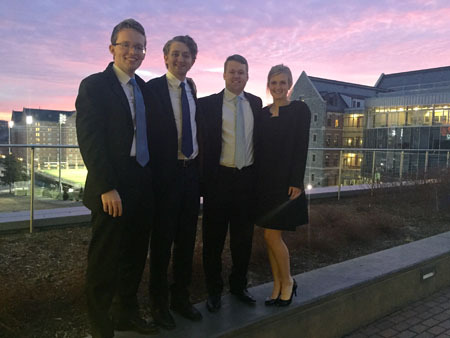 BHP students Alexandre Ghadially, Blake Jones, Benedikt Kroll, and Catherine Anne Prideaux took fourth place at the 2015 McDonough-Hilltop Business Strategy Challenge at Georgetown University in Washington D.C. this past weekend. Twenty teams from around the world competed in this unique non-profit consulting case competition. This year’s case centered on strategically expanding For Love of Children’s (FLoC) educational support services into more low-income areas around DC. The main goal of FLoC is to serve disadvantaged students in the DC community through one-on-one tutoring and college prep all free of charge. While FLoC has been located in the heart of the city close to where its volunteers, young professionals, work, they are planning to open up a second location on the outskirts of town in a historically low-income area. “The idea behind FLoC’s expansion is to establish a presence in the community where its services are needed most; our challenge was to find a way to adequately incentivize volunteers to go to the new location which is now, at best, a 45 minute commute via public transportation each way,” said Alexandre Ghadially. The team presented a three-part proposal focusing on the expansion, recruiting and retaining volunteers, and restructuring the staffing model in order to achieve maximum efficiency without sacrificing FLoC’s primary focus: serving the children. “The competition was not about the bottom line; it was about the net impact on the DC community as a whole. We never built models or even opened Excel really. Unlike any of my previous competitions, this case challenged me to seek more creative solutions with extremely limited resources,” noted Benedkit Kroll. The team was given 36 hours to work following a live presentation of the case and a live Q&A with the client. The team advanced to finals where they presented in front of their client, a panel of industry professionals serving as judges, and all their competitors. “The McDonough-Hilltop Challenge is truly special. I am grateful for the unique opportunity to work with and make an impact on a local non-profit while competing with students from across the globe. I hope MHBSC continues with this competition and their mission and that McCombs continues to be a part of it,” said Blake Jones. 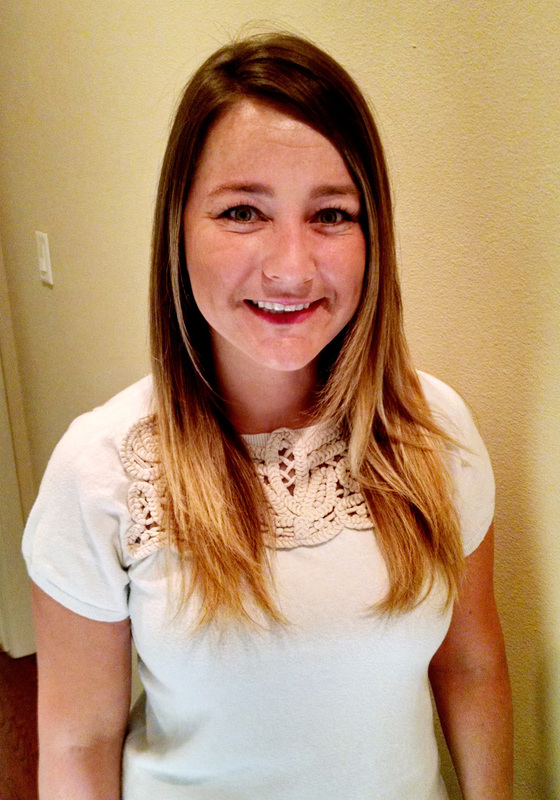 “Participating in the competition made me appreciate the case-based curriculum in the Business Honors Program. We essentially ‘prepped’ for the challenge every single class period whereas most teams specifically practiced cases with advisors prior to the competition. After making fun of our accents, most teams were shocked to find we had never actually competed together before McDonough,” said Catherine Anne Prideaux. In addition to working on the case, the team attended a professional hockey game, toured the Capitol, and enjoyed spending time with the other international teams. 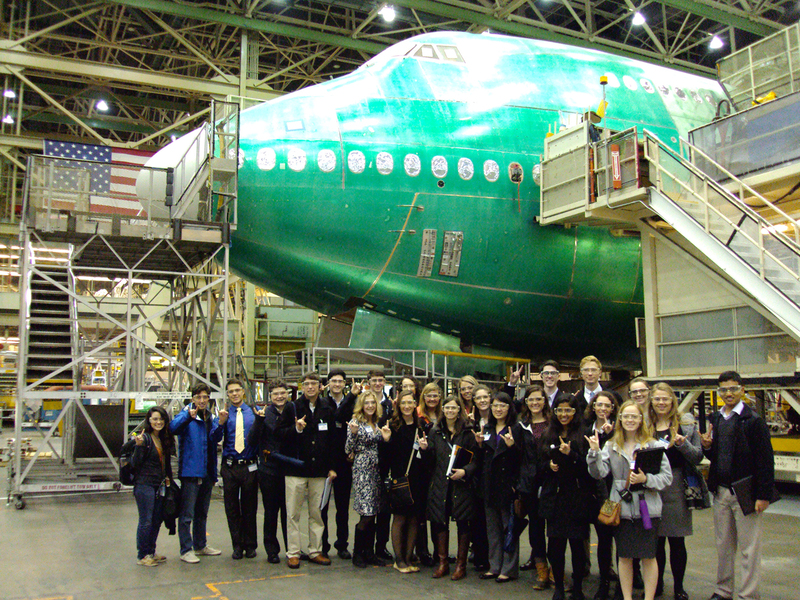 BHP students enjoyed their tour of Boeing. What a whirlwind of a weekend! As part of our yearly Company Field Trip, 22 members of the Honors Business Association took a four day trip to Seattle to tour Microsoft, Amazon, and Boeing and meet up with local alumni. Our first stop on the trip was Microsoft. We met up with BHP alum, Dina Consolino, and were able to have lunch in Microsoft’s spacious (and delicious!) cafeteria. We were also able to explore the visitor center which was full of new technology unreleased to the public such as a virtual mirror that allows you to see yourself in hundreds of outfits with the swipe of your hand. Finally, we had a Q&A session in the swanky Xbox building with fellow BHP and McCombs alumni. The following day, we woke up bright and early to tour Amazon’s headquarters, located in a conglomeration of buildings right next to downtown Seattle. During the tour, we were pleasantly surprised by the prevalence of employees’ pets and casual attire. Despite the misty weather, they brought us onto the roof, which had a stunning view of downtown Seattle and all of the Puget Sound. We also had the pleasure of meeting eight UT alums that work across all functions of the company. Hustling our way back to the hotel, we had a quick turnaround when a bus destined for Boeing’s headquarters picked us up an hour later. Beginning with a tour of Boeing’s humbling factory, we spent an hour and a half learning about their impressive assembly line spread throughout the world’s largest building by volume. Due to security reasons, we weren’t allowed to take any photos, but rather spent our time gaping at the intricacies of plane manufacturing. Soon after, we met up with some McCombs alumni who worked there to learn about their recruitment process and play Boeing trivia. That evening, we were offered an unforgettable experience through our alumni dinner on the 76th floor of the Columbia Tower, the tallest building in Seattle. The sky was perfectly clear and we were able to witness 360 degree views of downtown Seattle through floor-to-ceiling windows. We spent the evening eating hors d’oeuvres with a diverse group of alumni. On Saturday, everyone spent their free time exploring all the unique tourist activities Seattle has to offer. From perusing through Pike’s Place Market, strolling though Chihuly Gardens & Glass, and sampling local cuisine, everyone had a fantastic time meandering through the city. In the evening, we all went together to the Space Needle, which was the perfect capstone to an unforgettable weekend. Now, we are back to the hustle and bustle of school, and even though we have loads of classwork to make up and a whole lot of studying to do, I think I speak for everyone when I say the experience was well worth the trip.